"The Jaguars are a lot smarter than most of the people we fire them against!" Maj. "Panzer" Hanser, 21st Armoured Battalion. The Jaguar Missile is an air to surface and surface to surface missile. It can be rail or tube launched, dropped from an aircraft or fired from a vertical launch system (VLS). It is therefore capable of being launched from fixed and rotary wing aircraft, UAVs and ground vehicles. It is also used as a submunition for various large battlefield missiles. VLS pods of Jaguars may be carried on trucks or positioned in a combat area and fired remotely by any allied units within the area. Jaguar can engage a variety of targets including slow-moving aircraft. The Jaguar is an evolution of the 20th/21st century Hellfire and Brimstone missiles and closely resembles these weapons in basic appearance. The main difference is the Jaguar has a tri-mode seeker and the gimballed motor and thrust vectoring control technology developed for the Ifrit SRAAM (below). The thrust vectoring system gives greatly enhanced manoeuvrability and makes the weapon compatible with vertical launch systems. This allows for a reduction in the size of the stabilizing fins and an increase in body diameter. The larger diameter improves the efficiency of the warhead and increases fuel capacity. The Jaguar has a 200mm body diameter, is 1.8m long and weighs 49kg (108lb). Velocity is around 500 yd/s or Mach 1.3+. The Jaguar missile is compatible with the 320mm launch tubes designed for the Ifrit. The 20lb warhead is a HEMP shaped charge with considerable blast fragmentation effects. The design is modular so a SEFOP or Thermobaric charge can be fitted instead. A variant for suppression of enemy air defences (SEAD) homes in on radar sources. 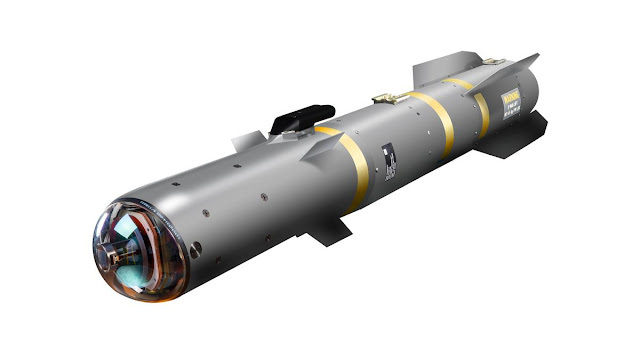 A variant containing a number of anti-armour/anti-personnel submunitions lacks the seeker element and is directed by GPS/INS. Launch tubes can also be used to hold the Ifrit missile in a surface to air or air to air capability. The tri-mode seeker uses mmW radar, passive IIR CCD and optional Semi-active Laser Homing (SALH). A Semi-active Laser Homing mode allows the launch vehicle or a friendly unit to designate a target. The seeker will lock on to a target so will continue to home in on a designated target even if the laser illumination is removed for some reason. It can also be used without laser designation. The Jaguar is also capable of various behaviour programs that are selected before launch. For example, the missile can be told to fly to a certain location, taking a particular route and then only search for targets within a certain area or of a certain type. This programming allows the missile to change course after being launched so an aircraft does not have to fly towards a target to engage it. It may use terrain features for cover and to approach the target from an unexpected or poorly protected direction. This feature also allows ground vehicles and helicopters to fire from behind cover. If a target is in close proximity the vertically launching Jaguar will make a 270 degree loop in another direction to then approach the target horizontally. The missile’s millimetric radar allows terrain avoidance and terrain following flight options, allowing for a nap of the earth course or avoidance of obstacles such as trees. The guidance system of Jaguar has been constantly updated during its lifespan so the system is both smart and versatile. Like many TS-era anti-armour weapons the Jaguar will target the relatively weaker top armour of an armoured vehicle. It will also select for the weaker areas of this such as the hatches or engine covers. If targeting a vehicle such as an SUV “technical” the primary target will be the driver’s side window or windshield. If no driver is visible and the vehicle being driven by AI it would target the engine. If, however, the rear of the vehicle is transporting troops or cybershells it would give these priority. Range depends on altitude and speed. For helicopters it can in excess of ten miles. For fixed wing aircraft it can be over twice this depending launch platform on altitude and speed. Homing (Hyperspectral Vision) attack (see p. B413), at missile's skill of 12. Firer rolls against Artillery (Guided Missile) to aim. On a success, the missile gets its Acc Bonus. Velocity is speed (yards/second). Jaguar can be set for “passive” homing, making a Homing (Hyperspectral Vision) attack or for “active” homing, making a Homing (Imaging Radar) attack. The defence suppression variant can be set for “anti-radiation” to track any radio or radar signals the target emits, making a Homing (Detect Radar and Radio) attack. Windtiger is a free-fall variant of Jaguar that replaces the rocket motor with aerodynamic control surfaces and fold-out glide wings. This is used as a submunition and from high-altitude aircraft. Oncilla is a effectively a smaller version of Jaguar designed to be compatible with launching systems for the 2.75” Hydra FFAR rocket. Its 7lb warhead makes it suitable for targets where Jaguar would be too powerful. It uses Semi-active Laser Homing but can make pre-programmed course changes before acquiring its target, allowing for off-boresight launch. This capability has been exploited to create a vertical launch system for Oncilla that can be mounted on small naval craft. Windcat is an rocket-boosted free-fall glide-bomb that uses many of the components of Oncilla and is used as a sub-munition or for dropping from high flying platforms. Intended as a low collateral damage weapon it uses warheads derived from 60mm mortar bombs or the ILCAS-60 weapon system. Windcat weighs 14lb and has a warhead of around 3.75lb. In stowed configuration it is 80mm x 800mm. Range is dependent on launch altitude and speed but can be in excess of 15 miles.